 The company was founded in 1884 by brothers George Percival and James Baker establishing an inheritance full of innovation and drama. Avid and discerning collectors of rare and iconic designs, the brothers began what has become one of the largest and most exciting privately owned textile archives in the world. Left to right: Company founders, George Baker Senior and George Percival Baker. 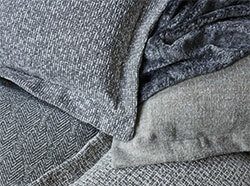 The Swaislands Fabric Company acquired by Baker. Their father, George Baker, who was born in 1822, had begun his career as a gardener distinguishing himself by designing the British Embassy gardens in Therapia, outside Constantinople (Istanbul). Constantinople was then a great emporium of Asiatic produce, and Baker’s entrepreneurial spirit led him to the export of Turkish goods, eventually establishing a London base. He then sent two of his five sons, George Percival and James, to England where together they set up GP & J Baker. 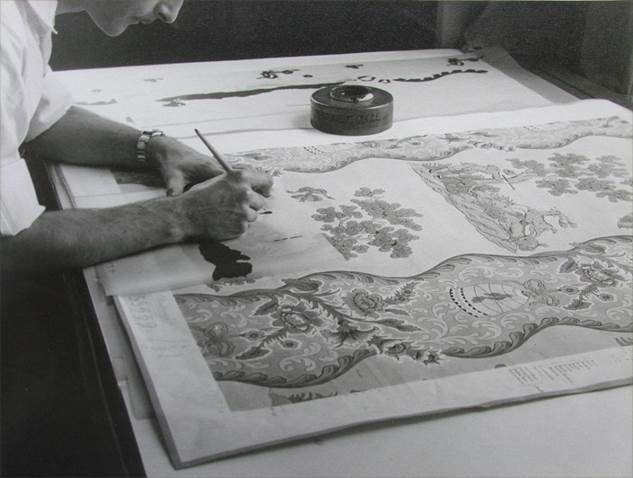 Shortly after, they purchased the renowned Swaisland Fabric Printing Company, gaining most of its printing blocks and huge archive of pattern books dating back to the 18th century. By 1893 GP & J Baker was employing some of the leading Arts and Crafts designers of the time and an in-house studio led by W.J. Thomas began developing designs from the extensive archive. George Percival constantly added to the archive, notably with the purchase of over 400 antique block prints from the Holzach studio in Paris around 1910, and had collected about 250 rare Indian printed cottons by 1920. 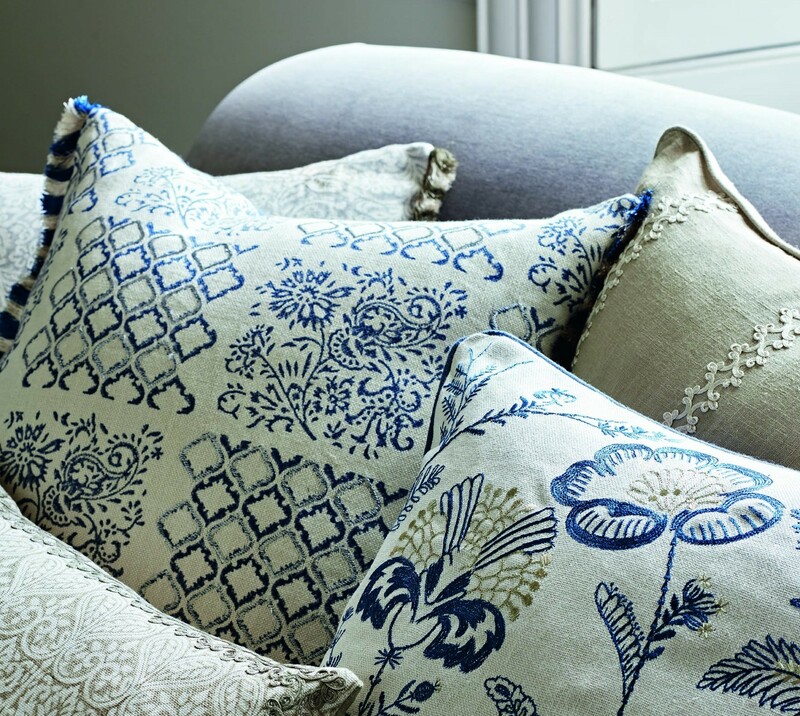 The company’s most popular designs printed in the early 1900s showed naturalistic drawn English garden flowers, and this became part of the enduring GP & J Baker style. George Percival Baker was a passionate horticulturalist himself, becoming a well-known figure in the Royal Horticultural Society. 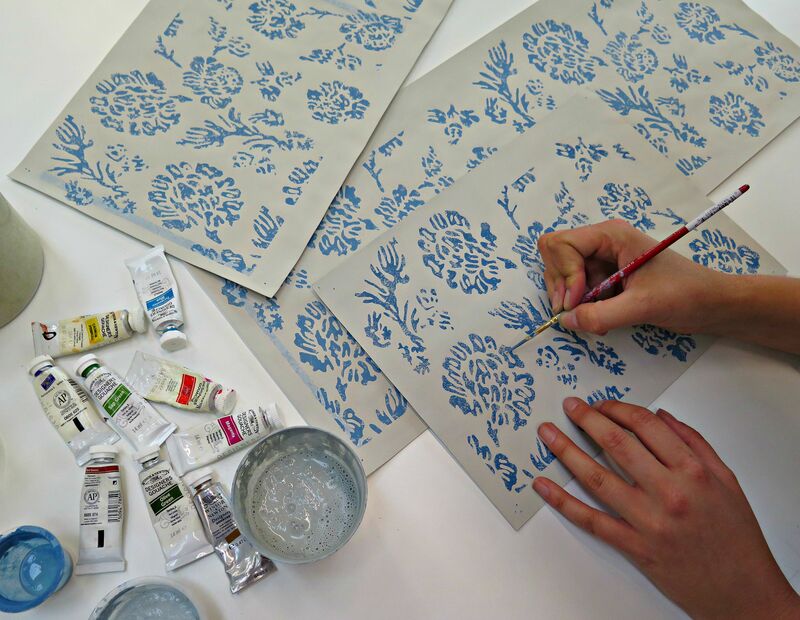 Workers using wood printing blocks applying textile inks. 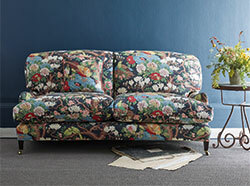 Designs from this rich resource are skillfully adapted to meet with today’s tastes and colour palettes and in addition to developing its own unique handwriting, GP & J Baker continues to grow its reputation as one of the world’s innovators of fabric design. A map of the location from the English style gardens set in Turkey, designed by George Baker. The archive is amazingly diverse ranging from Chinese wallpapers, clothing, church vestments and Peruvian tunics to quilts and curtains. Italian and Turkish velvets, beautiful Indian prints, French toiles, Indonesian batiks, early English glazed chintz prints and Art Nouveau original paintings make up this amazing collection which probably contains something from each of the last 100 centuries as well as from half the globe. Original fabric book swatches showing colourways. Unique to this remarkable archive are over one hundred volumes of pattern books containing thousands of samples and designs from the 18th and 19th centuries. 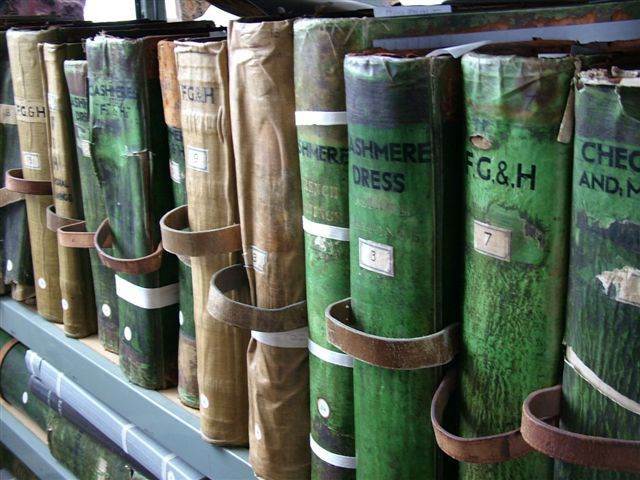 These large vellum-bound books were acquired by George Percival Baker when he bought the Swaisland Printworks, home to the leading British calico printer of the early Victorian era. They provide an extraordinary insight into all the major trends during the 1800s and are considered to be ‘a reliable history of design and printing in England’. All of our designers, especially the GP & J Baker studio, make constant use of the archive. From this treasure trove has come such stunning large scale prints as ‘Nympheus’ and ‘Magnolia’ as well as the more delicate ‘Oriental Bird’ and ‘Peony and Blossom’. A Regency pattern book provided the design for the elegant silk, ‘Perandor Damask’ which was also translated into a dramatic wallpaper. To date only a fraction of this resource has been used which means that our studios will be able to explore its rich heritage for decades to come. 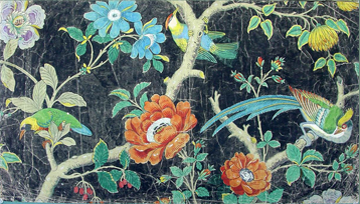 Original Chinoiserie and botanical paintings.